Is it possible to open deleted WhatsApp messages on iPhone? Is it possible to open deleted WhatsApp messages on iPhone? Read here and you will learn how to recover deleted whatsapp messages from iPhone. WhatsApp is an instant message app which has been widely used around the world. With this free message app, people can send messages as text, image, voice note, audio, video etc without any cost, only require internet connection. So it is quite easy to lose some whatsapp messages or whatsapp images from your iPhone. When you are encountered with the whatsapp messages loss problem, how to open those deleted whatsapp messages on iPhone? We've found methods here to help you recover lost whatsapp messages on iPhone easily. Now what you need know is that you can use WhatsApp to back up all chat history in your iPhone directly. Just turn on WhatsApp > Chats > Chat Backup. If you have backed up all whatsapp messages before deleting them, it's easy. Just uninstall WhatsApp on your iPhone and then, reinstall it. The program will ask you whether you need to restore from backup once you run the app again. But if you have no backup for those deleted messages, how to open deleted whatsapp messages on iPhone? Keep reading. If you need to recover deleted whatsapp messages without backup, iFonebox is your best helper to open those lost whatsapp messages. As is known that iFonebox is a professional iPhone data recovery software which supports to recover deleted messages, whatsapp messages, contacts, notes, etc, from iPhone and iPad directly. Also, if you want to selectively extract and restore data from iTunes or iCloud backup, iFonebox will also do you a favor. How to open deleted WhatsApp messages on iPhone? Launch iFonebox. Choose Recover from iOS Device mode. Don't forget to plug in your iPhone to the computer with USB cable. Once connected successfully, your iDevice will be detected by iFonebox. Just click Start button to begin the analysis process. Scan WhatsApp messages from iPhone. Click on WhatsApp Messages item to start scanning and analysis process. Preview and select deleted whatsapp messages to recover. Now you have the chance to view and choose all deleted messages you need, then click Recover to PC button to transfer them to your computer. 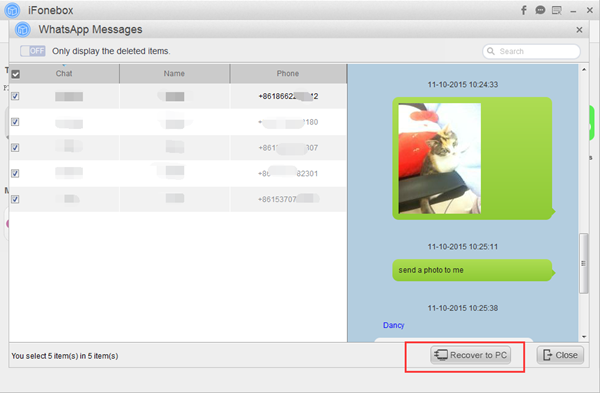 In short, without backup, you can still recover deleted WhatsApp messages under the help from iFonebox.